Under the Banner of Heaven NPR coverage of Under the Banner of Heaven: A Story of Violent Faith by Jon Krakauer. News, author interviews, critics' picks and more. May 3, 2005  In his book Under the Banner of Heaven, author Jon Krakauer examined the history of the Church of Jesus Christ of Latter-day Saints and of fundamentalist splinter groups, who are not Mormons and who broke off from the church after it abandoned the practice of plural marriages. The book excerpt below looks at the history of the polygamous community in Colorado City, Ariz.
July 30, 2003  Krakauer is the author of the book Into Thin Air, about the disastrous 1996 Mount Everest climb in which eight climbers were killed. 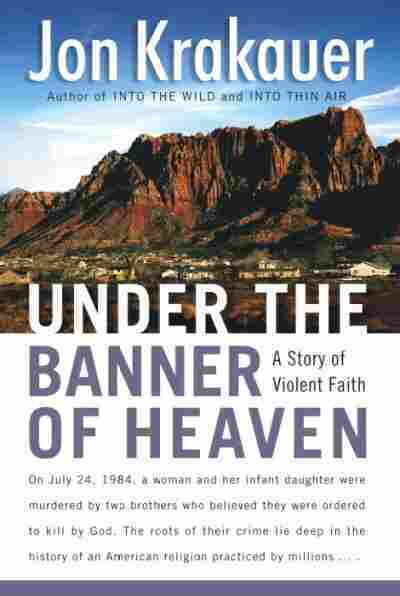 His new book, Under the Banner of Heaven: A Story of Violent Faith, is about Mormon fundamentalism and the story of the two Lafferty brothers who murdered a woman and her infant daughter because they say that they had received a revelation from God to do so. Krakauer reports there are some 40,000 Mormon fundamentalists in the American West, Canada and Mexico. The Mormon Church does not recognize fundamentalists as part of their faith. Balanced atop the highest spire of the Salt Lake Temple,gleaming in the Utah sun, a statue of the angel Moroni standswatch over downtown Salt Lake City with his golden trumpetraised This massive granite edifice is the spiritual andtemporal nexus of the Church of Jesus Christ of Latter-daySaints (LDS), which presents itself as the world's only truereligion. Temple Square is to Mormons what the Vatican is toCatholics, or the Kaaba in Mecca is to Muslims. At last countthere were more than eleven million Saints the world over, andMormonism is the fastest-growing faith in the WesternHemisphere. At present in the United States there are moreMormons than Presbyterians or Episcopalians. On the planet asa whole, there are now more Mormons than Jews. Mormonism isconsidered in some sober academic circles to be well on itsway to becoming a major world religion-the first such faithto emerge since Islam. Next door to the temple, the 325 voices of the MormonTabernacle Choir swell to fill the tabernacle's vast interiorwith the robust, haunting chords of "Battle Hymn of theRepublic," the ensemble's trademark song: "Mine eyes have seenthe glory of the coming of the Lord .."
To much of the world, this choir and its impeccably renderedharmonies are emblematic of the Mormons as a people: chaste,optimistic, outgoing, dutiful. When Dan Lafferty quotes Mormonscripture to justify murder, the juxtaposition is soincongruous as to seem surreal. The affairs of Mormondom are directed by a cadre of elderlywhite males in dark suits who carry out their holy duties froma twenty-six-story office tower beside Temple Square. To aman, the LDS leadership adamantly insists that Lafferty shouldunder no circumstances be considered a Mormon. The faith thatmoved Lafferty to slay his niece and sister-in-law is a brandof religion known as Mormon Fundamentalism; LDS Churchauthorities bristle visibly when Mormons and MormonFundamentalists are even mentioned in the same breath. AsGordon B. Hinckley, the then-eighty-eight-year-old LDSpresident and prophet, emphasized during a 1998 televisioninterview on Larry King Live, "They have no connection with uswhatever. They don't belong to the church. There are actuallyno Mormon Fundamentalists." Nevertheless, Mormons and those who call themselves MormonFundamentalists (or FLDS) believe in the same holy texts andthe same sacred history. Both believe that Joseph Smith, whofounded Mormonism in 1830, played a vital role in God's planfor mankind; both LDS and FLDS consider him to be a prophetcomparable in stature to Moses and Isaiah. Mormons and MormonFundamentalists are each convinced that God regards them, andthem alone, as his favored children: "a peculiar treasure untome above all people." But if both proudly refer to themselvesas the Lord's chosen, they diverge on one especiallyinflammatory point of religious doctrine: unlike theirpresent-day Mormon compatriots, Mormon Fundamentalistspassionately believe that Saints have a divine obligation totake multiple wives. Followers of the FLDS faith engage inpolygamy, they explain, as a matter of religious duty. There are more than thirty thousand FLDS polygamists living inCanada, Mexico, and throughout the American West. Some expertsestimate there may be as many as one hundred thousand. Eventhis larger number amounts to less than 1 percent of themembership in the LDS Church worldwide, but all the same,leaders of the mainstream church are extremely discomfited bythese legions of polygamous brethren. Mormon authorities treatthe fundamentalists as they would a crazy uncle-they try tokeep the "polygs" hidden in the attic, safely out of sight,but the fundamentalists always seem to be sneaking out toappear in public at inopportune moments to create unsavoryscenes, embarrassing the entire LDS clan. The LDS Church happens to be exceedingly prickly about itsshort, uncommonly rich history-and no aspect of that historymakes the church more defensive than "plural marriage." TheLDS leadership has worked very hard to persuade both themodern church membership and the American public that polygamywas a quaint, long-abandoned idiosyncrasy practiced by a merehandful of nineteenth-century Mormons. The religiousliterature handed out by the earnest young missionaries inTemple Square makes no mention of the fact that JosephSmith-still the religion's focal personage-married at leastthirty-three women, and probably as many as forty-eight. Nordoes it mention that the youngest of these wives was justfourteen years old when Joseph explained to her that God hadcommanded that she marry him or face eternal damnation. Polygamy was, in fact, one of the most sacred credos ofJoseph's church-a tenet important enough to be canonized forthe ages as Section 132 of The Doctrine and Covenants, one ofMormonism's primary scriptural texts. The revered prophetdescribed plural marriage as part of "the most holy andimportant doctrine ever revealed to man on earth" and taughtthat a man needed at least three wives to attain the "fullnessof exaltation" in the afterlife. He warned that God hadexplicitly commanded that "all those who have this lawrevealed unto them must obey the same .. and if ye abide notthat covenant, then are ye damned; for no one can reject thiscovenant and be permitted to enter into my glory." Joseph was murdered in Illinois by a mob of Mormon haters in1844. Brigham Young assumed leadership of the church and ledthe Saints to the barren wilds of the Great Basin, where inshort order they established a remarkable empire andunabashedly embraced the covenant of "spiritual wifery." Thisboth titillated and shocked the sensibilities of Victorian-eraAmericans, who tended to regard polygamy as a brutish practiceon a par with slavery. In 1856, recognizing the strength ofthe anti-polygamy vote, Republican candidate John C. Fremontran for president on a platform that pledged to "prohibit inthe territories those twin relics of barbarism-Polygamy andSlavery." Fremont lost the election, but a year later the manwho did win, President James Buchanan, sent the U.S. Army toinvade Utah, dismantle Brigham Young's theocracy, anderadicate polygamy. The so-called Utah War, however, neither removed Brigham frompower nor ended the doctrine of plural marriage, to theannoyance and bafflement of a whole series of Americanpresidents. An escalating sequence of judicial and legislativechallenges to polygamy ensued, culminating in theEdmunds-Tucker Act of 1887, which disincorporated the LDSChurch and forfeited to the federal government all churchproperty worth more than $50,000. With their feet held fast tothe fire, the Saints ultimately had no choice but to renouncepolygamy. But even as LDS leaders publicly claimed, in 1890,to have relinquished the practice, they quietly dispatchedbands of Mormons to establish polygamous colonies in Mexicoand Canada, and some of the highest-ranking LDS authoritiessecretly continued to take multiple wives and perform pluralmarriages well into the twentieth century. Although LDS leaders were initially loath to abandon pluralmarriage, eventually they adopted a more pragmatic approach toAmerican politics, emphatically rejected the practice, andactually began urging government agencies to prosecutepolygamists. It was this single change in ecclesiasticalpolicy, more than anything else, that transformed the LDSChurch into its astonishingly successful present-dayiteration. Having jettisoned polygamy, Mormons graduallyceased to be regarded as a crackpot sect. The LDS Churchacquired the trappings of a conventional faith so successfullythat it is now widely considered to be the quintessentialAmerican religion. Mormon Fundamentalists, however, believe that acceptance intothe American mainstream came at way too high a price. Theycontend that the Mormon leaders made an unforgivablecompromise by capitulating to the U.S. government on polygamyover a century ago. They insist that the church sold themout-that the LDS leadership abandoned one of the religion'smost crucial theological tenets for the sake of politicalexpediency. These present-day polygamists therefore considerthemselves to be the keepers of the flame-the only true andrighteous Mormons. In forsaking Section 132-the sacredprinciple of plural marriage-the LDS Church has gone badlyastray, they warn. Fundamentalist prophets bellow from theirpulpits that the modern church has become "the wickedest whoreof all the earth." Mormon Fundamentalists probably cite Section 132 of TheDoctrine and Covenants more than any other piece of LDSscripture. Their second-most-popular citation is likelySection 85, in which it was revealed to Joseph that "I, theLord God, will send one mighty and strong ... to set inorder the house of God." Many fundamentalists are convincedthat the one mighty and strong is already here on earth amongthem, "holding the scepter of power in his hand," and thatvery soon now he will lead the Mormon Church back onto theright path and restore Joseph's "most holy and importantdoctrine." Extreme and bizarre religious ideas are so commonplace inAmerican history that it is difficult to speak of them asfringe at all. To speak of a fringe implies a mainstream, butin terms of numbers, perhaps the largest component of thereligious spectrum in contemporary America remains what it hasbeen since colonial times: a fundamentalist evangelicalismwith powerful millenarian strands. The doomsday theme hasnever been far from the center of American religious thought.The nation has always had believers who responded to thisthreat by a determination to flee from the wrath to come, toseparate themselves from the City of Destruction, even if thatmeant putting themselves at odds with the law and with theircommunities or families.... We can throughout Americanhistory find select and separatist groups who looked to aprophetic individual claiming divine revelation, in a settingthat repudiated conventional assumptions about property,family life, and sexuality. They were marginal groups,peculiar people, people set apart from the world: the Shakersand the Ephrata community, the communes of Oneida and Amana,the followers of Joseph Smith and Brigham Young. Snaking diagonally across the top of Arizona, the Grand Canyonis a stupendous, 277-mile rent in the planet's hide thatfunctions as a formidable natural barrier, effectively cuttingoff the northwestern corner from the rest of the state. Thisisolated wedge of backcountry-almost as big as New Jersey,yet traversed by a single paved highway-is known as theArizona Strip, and it has one of the lowest populationdensities in the forty-eight conterminous states. There is, however, one relatively large municipality here.Colorado City, home to some nine thousand souls, is more thanfive times as populous as any other town in the district.Motorists driving west on Highway 389 across the parchedbarrens of the Uinkaret Plateau are apt to be surprised when,twenty-eight miles past Fredonia (population 1,036, thesecond-largest town on the Strip), Colorado City suddenlymaterializes in the middle of nowhere: a sprawl of smallbusinesses and unusually large homes squatting beneath atowering escarpment of vermilion sandstone called CanaanMountain. All but a handful of the town's residents are MormonFundamentalists. They live in this patch of desert in the hopeof being left alone to follow the sacred principle of pluralmarriage without interference from government authorities orthe LDS Church. Straddling the Utah-Arizona border, Colorado City is home toat least three Mormon Fundamentalist sects, including theworld's largest: the Fundamentalist Church of Jesus Christ ofLatter Day Saints. More commonly known as the United EffortPlan, or UEP, it requires its members live in strictaccordance with the commandments of a frail,ninety-two-year-old tax accountant-turned-prophet named RulonT. Jeffs. "Uncle Rulon," as he is known to hisfollowers,traces his divinely ordained leadership in an unbroken chainthat leads directly back to Joseph Smith himself. Although hisfeeble bearing would seem to make him poorly cast for therole, the residents of Colorado City believe that Uncle Rulonis the "one mighty and strong" whose coming was prophesied byJoseph in 1832. "A lot of people here are convinced Uncle Rulon is going tolive forever," says DeLoy Bateman, a forty-eight-year-oldscience teacher at Colorado City High School. Not only wasDeLoy born and raised in this faith, but his forebears weresome of the religion's most illustrious figures: hisgreat-grandfather and great-great-grandfather were among thethirteen founding members of the Mormon Fundamentalist Church,and his adoptive grandfather, LeRoy Johnson, was the prophetwho immediately preceded Uncle Rulon as the leader of ColoradoCity. At the moment, DeLoy is driving his thirdhand Chevy vanon a dirt road on the outskirts of town. One of his two wivesand eight of his seventeen children are riding in the back.Suddenly he hits the brakes, and the van lurches to a stop onthe shoulder. "Now there's an interesting sight," DeLoydeclares, sizing up the wreckage of a television satellitedish behind some sagebrush off the side of the road. "Lookslike somebody had to get rid of their television. Hauled itout of town and dumped it." Members of the religion, he explains, are forbidden to watchtelevision or read magazines or newspapers. The temptations ofthe outside world loom large, however, and some members of thefaith inevitably succumb. "As soon as you ban something,"DeLoy observes, "you make it incredibly attractive. Peoplewill sneak into St. George or Cedar City and buy themselves adish, put it up where it can't easily be seen, and secretlywatch TV during every free moment. Then one Sunday Uncle Rulonwill give one of his sermons about the evils of television.He'll announce that he knows exactly who has one, and warnthat everyone who does is putting their eternal souls inserious jeopardy. "Every time he does that, a bunch of satellite dishesimmediately get dumped in the desert, like this one here.